Besides the foster dogs and my online store, I've also been growing sunflowers. This has been the best year so far, for my garden. I suppose plenty of water is helping. 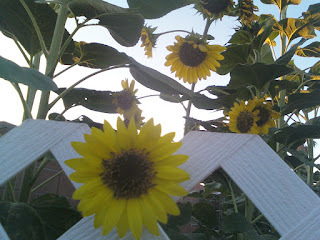 This year I decided to grow sunflowers for beauty and shade for the other plants. The native peoples used to grow the 3 sisters, corn, pole beans and squash for shade and other mutual benefits. I have never had much luck with corn so I choose sunflowers. They have done well. The only major set-back was when the puppies got over the fence and attacked. I only lost one and was able to prop up the others and they recovered. I bought the mixed pack of seeds so some are multiple small flowers, some are over 8ft tall and others are a pretty rust color. I planted tomato plants under them and those are doing well. I even used the sunflower stalks to hold up the tomato plants by tying green garden tape around them. The squash was doing well until yesterday. It can't take the June heat. It has been around 106F. Yesterday the squash wilted and today it looked worse. Maybe I should have planted pole beans instead but I don't like beans that much. The marigolds that I planted underneath the sunflowers are doing great too. I can't wait until the tomatoes are ready to eat. I got 4 squash before the plants started to struggle. Too bad, I was looking forward to more squash. I think I might actually buy some from the store. People have started decorating their yards with metal flowers here. No watering required and puppy-proof!